Everyone seems to like a little something different on their caramel apples. Whether its nuts, coconut, jimmies or just plain caramel we all have our own preference. This dip bar is a fun and yummy way to let your guests choose their topping! Apples - for mini dippers cut the apples into bite size chunks! Unwrap the caramel squares and place in a medium size saucepan with 1/4 cup water. Keep over low heat until all the caramels have melted. To keep warm place in a small slow cooker on low. Set up your toppings in shallow bowls along side the apples and skewers. 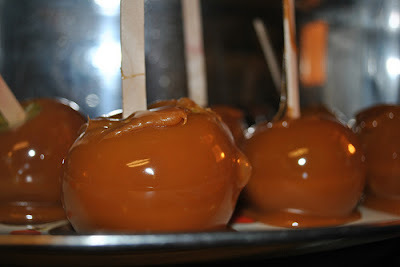 Place the apple onto the skewer, dip in caramel and then in the topping. Enjoy!